Once you've had a baby, hopefully, you've taken the big step to writing a will and creating a trust to protect your new family. Don't stop there. Along with a will, you'll also want to write letters to your wife, and importantly to your kids in the horrible, and we hope unlikely, event that you aren't there to watch them grow up. A legacy letter is a note you drop in the box you keep your will in, or give to your lawyer that is then given to your kids. You should plan what you want to write carefully, though. 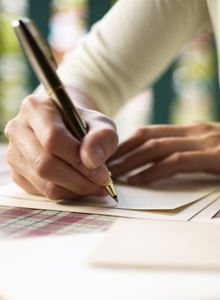 Check out these five things every father should include in their legacy letters. Teach big life skills: Anyone can Google instructions for how to shave, but only fathers can teach sons how to talk to girls. Talk about yourself: Though you're writing to connect with your kids, give them an opportunity to get to know who you are. Write more, not less: This may be the last time you get to talk to your kids, so don't worry about editing yourself too much. Just write from the heart, as much as you can. Write over time: It's too difficult to keep everything you intend to write at the tip of your pen, so writing over a long period of time can help you get all of your thoughts onto the page. Emphasize love: This may seem obvious, but legacy letters are supposed to be the last chance fathers have to connect with their kids. Don't miss this step!